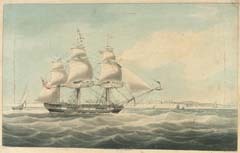 Thomas Matheson and his wife Mary Strath arrived in Australia on 12 August, 1838, on board Lady Kennaway, which sailed from Leith, Scotland on the 19 April 1838 and from The Downs on 25 April, 1838. They were accompanied by their daughters Margaret, age 5, Christina, age 3 and Mary, who was eighteen months. Thomas gave his profession as a labourer, although he was a tailor, and Mary gave her profession as a dressmaker. Thomas age according to his immigration record and his death certificate would have his birth as 1811. No record of his has been found, but a record for a Thomas Matheson in Midgarty, Loth, on 20 September, 1809, father Alexander, could be relevant. Unfortunately the mother for this birth is not recorded, but Thomas gave his mother's name as Margaret, a housekeeper, when he sailed for Australia. After proclamation of Banns, Thomas Matheson, tailor in Aberdeen, was on the twenty third day of June, one thousand eight hundred and thirty two married at Aberdeen to Mary, daughter of Alexander Straith, Tollkeeper in the parish of Banchory, Devenick, by the Reverend Hugh Mackenzie, Minister of Gaelic Chapel, Aberdeen, in presence of these Witnesses, the said Alexander Straith and William McDonald, Labourer in Aberdeen. The records for several other children born to the family also state that Alexander Strath was a Tollkeeper. Also the above Thomas Matheson died 23 July 1862 aged 51 years"
Margaret Burnie Matheson, born 1833 in Aberdeen, died 1918, in Burwood. Margaret married Edmund John Baily, at St Andrews Scots Church in 1850. Edmund Baily had been transported for embezzlement, and arrived in Sydney on Portsea, in December, 1838. On acquiring a ticket of leave in 1848, he was employed by Michael Balkeney, a Shipping, Family and Carcass Butcher, his introduction to the meat industry. After obtaining a conditional pardon in 1849, it is recorded that Baily leased a slaughter house. His partnership with Thomas Playfair began in 1860, so it can be assumed in the intervening years he built his business to include butcher shops. Edmund Baily died in 1862, not long after he had been elected Chairman of the Municipal Council of Waverley. Margaret and Edmund had seven children, Edmund Strath, Sarah, Charles, Elizabeth, Alfred, Katherine, and Herbert Strathmore. Christina Straith Matheson, born 1835, Aberdeen, died Waverley, 1921. Christina married George Henry Bethel in 1855. They had eleven children, George Thomas in 1856, Alexander S (born and died 1857), Mary Straith in 1859, Christina S in 1860, Walter Edmund in 1863, Edmund J (born 1865died1866), Margaret (born and died 1869), Ernest S (born and died 1871), Lillian in 1873, Ernest Stuart in 1875 and Caroline who died in 1923. Mary Matheson, born in Aberdeen in 1837. Mary married Henry Ferdinand Camroux in 1860. They had nine children, about which I only know their births. Mary L 1861, Susan 1864, May born and died 1866, Henry F born and died 1866, Henry 1868, Minnie 1870, Mabel 1871, Ellen Strath 1876, and Mabel E 1878. Ellen Matheson, born 1839, Sydney. Ellen married Thomas Playfair in 1860 at Woolloomooloo. This was the year that Edmund Baily went into partnership with Thomas Playfair, so it was probably this that led to Thomas meeting Bailys wife and her younger sister. Thomas and Ellen had four children, Thomas Arnold in 1861and Edmund John Baily in 1863, Alexander born and died 1865, and Alfred Matheson born 1866 died 1867. Ellen died in March 1866, about two weeks after the birth of Alfred, who died the following year. Amelia Jane Matheson born Sydney 1844. Age 18 at Thomas death. Isabella Faith Matheson born Sydney 1846. Isabella married Michael Yates. They had 4 children, Ada Blanche, 1872-1904, Jane G born 1873, Georgina M 1875-1876, and Charles. Georgina Hope Matheson born Sydney 1849. Georgina married Thomas Playfair after the death of her half sister Ellen. They had five children, two who died in infancy, Jessie 1869-1951, Alfred Donald 1871-1943 and Walter born and died 1872. The Matheson Motto, Fac et Spera, means Do and Hope. 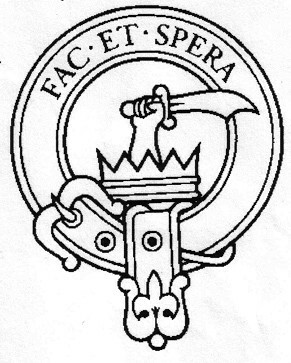 The badge is an arm holding a sword, rising out of a crown. The name comes from the Gaelic MacMathain, meaning "Son of the Bear".